Canadian Space Agency astronaut Chris Hadfield posted this picture to Twitter on Jan. 6, 2013. An astronaut living on the International Space Station has captured a spectacular view of Earth's volcanoes as they appear from high above the planet. "Volcanoes look dramatic at dawn. They startled me when I spotted them through the lens," astronaut Chris Hadfield of the Canadian Space Agency wrote in a Twitter post Sunday (Jan. 6). He chronicles his mission with updates and photos as @Cmdr_Hadfield. Hadfield snapped the photo as the station soared 260 miles (418 kilometers) above the striking volcanic peaks. While he didn't name the volcanoes he was observing, Twitter users identified the peaks in his picture as the Klyuchevskaya group in Russia's Kamchatka Peninsula. 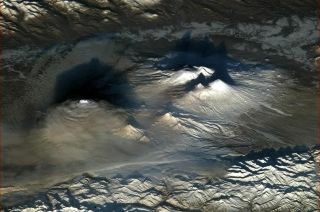 Those volcanoes were captured in another stunning photograph taken from the space station on Nov. 3. At the time that picture was taken, low-lying clouds covered the surrounding terrain, and interaction of the volcanoes with air currents created rippled cloud patterns, NASA's Earth Observatory reported. The volcanoes of the Kamchatka Peninsula typically are fairly active; they lie along the Pacific Ring of Fire, home to 75 percent of the world's active and dormant volcanoes. Hadfield is set to become Canada's first space commander. He launched into orbit in December aboard a Russian rocket to kick off a months-long mission to the ISS, serving as a flight engineer on the space station's six-man Expedition 34 crew. In March, he will take charge as commander of the station's Expedition 35. He is due to return to Earth in mid-May.